Looking for a top-rated mini C-Arm? If not, the idea of a smaller, lighter, and more affordable C-Arm may be more interesting to you. Either way, the GE OEC 6600 mini C-Arm is an optimal choice for general surgery, orthopedic, or hand and foot surgery purposes.In terms of its size, the GE OEC 6600 is designed for compact spaces and easy transportation with its 27-inch by 27-inch footprint. The GE OEC 6600 also provides exceptional image quality via its Dual Mode 6/4 Inch Image Intensifier, motion artifact reduction system, and gamma correction. 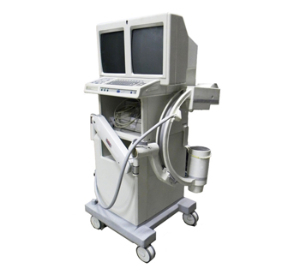 While imaging, this C-Arm uses dual 16-inch Hi-Resolution monitors to ensure a high level of quality. Small, flexible, and cost-effective, the GE OEC 6600 C-Arm is designed to fit your budget and clinical needs.